Only played once. Seems fun, but was overwhelming. Decided I'm gonna have to watch a bunch of youtube videos to get up to speed before jumping in, and haven't had the time lol. Just jump in, it is only a game. First game of the day. Kill leader. Final kill...and that all important W. Now we rollin! If anyone cares, there is a tourney for this game today. Euro people first then NA later. Shroud, DrDisrespect, etc in it. Honestly, Good game. But that connection....Jesus. Not fortunate enough to be in a Region where servers are available so normally I must connect to Europe. But this game gives THE WORST performance out of all the others. Really rubbery annoying lag and enemies not dieing and s***. I mean 8 direct shots from a SHOTGUN (EVA or whatever it's called). Can't say I've personally played in a terrible feeling match, although one instance I'm fairly certain I shot a guy a couple times in the back and it didn't seem to register. I have seen some streams where the match is running slower than normal. I'd rather be playing Killer Instinct. Anybody up for some matches? Just had my best couple of matches in the game, especially the last one. 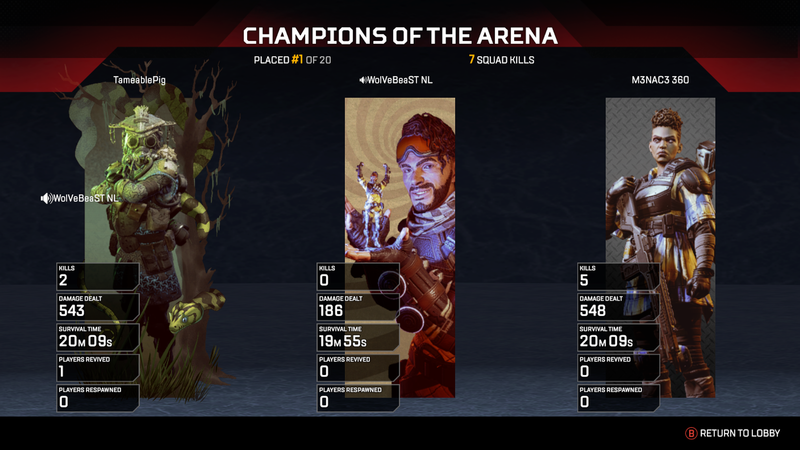 Got to second place but had 5 kills in the match, including finishing off two teams after both my teammates went down. Peacemaker totally OP lol. But I started actually using my abilities (Bangalore) to help mask retreats, grenades into a cluster of downed enemies, etc. Another I had ran off to heal up and came back to lone enemy trying to revive, slid right at him and headshotted him. At the end it was 1v2 though and they just bombarded the hell out of me. Had no where to go as it was close to the smallest rings it can get and barely any cover on my side. Still pretty damn hype. So how would this game be for someone not that into BR games? I'm interested, but the BR stuff never did it for me personally. This looks like it breaks the mold a bit, but I hate games where it's one death and you're done. I had no interest in BR until Black Ops 4. I played Blackout maybe 15-20 matches and it was ok, but never went back after a week of playing it. This game though, while I'm terrible, am having a lot of fun. Have been watching a s*** load of it on Twitch as well. I have played in a couple. Hits not registering. Movement feels like you are in honey. They have been few and far between. Then you will likely hate this aswel, despite the respawning feature. I would say this game is the most accessable BR I have seen, though. I'm pretty much a battlefield player through and through for my MP fix but this has taken it's spot, doesn't help BF5 is losing a lot of steam. But yea if you hate one death and done BR games aren't for ya. Easy enough to get in a match though and can play with different legends. Just hoping Firestorm is decent and not delayed. These drip feed Live services just kill games...it is never the right contenr. BF5 is just all weapons and meh variation modes, it just isn't enough. It NEEDS more maps, less conquest variation and more unique modes like Firestorm, Combined arms, and Rush needs to be permanant. Kind of has me worrid for Division 2's Live Service. Got my second win last night. I've placed Top 3 so many times though it's getting ridiculous, especially being the last squad downed. First patch. Available now...1.2GB on Xbox. Glad they're fixing this specifically. Had this issue way too often. Might as well. Thanks for the opinions guys! yep. Got top level skins, banners and poses for both. I have the cuurency to buy one, but am waiting for season 1 in March as it sounds like new legends will be coming too. Yeah I'll probably pick up the Battle Pass, but still would like to unlock Caustic first. I should be able to get there before the release. Any details release on pricing or what bonuses come with buying the Battle Pass? I have it for Rocket League and it's more than worth it. No details at all as far as I can see. Kind of funny, most people (including myself) thought "why bring out a titanfall BR game without titans?" yet this game seems to be really popular, I haven't played it but I know a lot of people who have and they all have good things to say about it. The issue was that the leaks called it a Titanfall BR. This isn't Titanfall...and lets face it, why would you make a Titanfall game absent the two main things that make Titanfall Titanfall? You wouldn't and they didn't. They easily could have kept wall running, but chose not to, I imagine this was done for identity reasons. For when random team plays really well, gets into the last two squads, has height advantage and zone advantage but decides to charge the enemy and hands them victory. I had the exact opposite yesterday..uphill battle..walking upwards into bullets against the final team. There's a small camp on a ridge..really great for snipers. We had to climb left and go up with the path to the left for the final skirmish and they had the high ground on us. I forget what that region is called.